Consumers can enjoy cottonseed oil too! For example, cottonseed oil enhances your wild turkey’s natural flavor, rather than masking it. Plus, it’s one of the healthiest oils for deep frying the prized bird. Deep fried turkey is moist and delicious and not at all greasy. The inside of the bird steams, locking in nutrients and flavors. When you boil or bake, many of those nutrients and flavors escape. Marinades, injected seasonings and dry rubs provide additional flavor. Look for cottonseed oil at sporting good stores, like Bass Pro Shops. These retailers stock all the essential items for making a wildly memorable feast. Reveal your wild side. 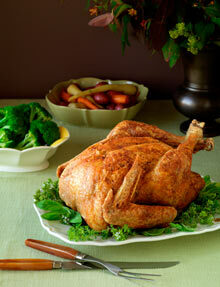 Deep fry your turkey in cottonseed oil to enhance its natural flavor. Annette Pierce and the Wisconsin Innovation Kitchen crew don’t stop cooking when the working day ends. In fact, they’re proud to share their extracurricular experiences with cottonseed oil (CSO). Since her establishment specializes in healthy creations, Pierce is particularly fond of CSO-infused salads. Like Hogz & Honeez’s Fletcher, she encourages home cooks to mix cottonseed oil with balsamic vinegar to create a wholesome, clean-tasting vinaigrette. She’s also a big advocate of using the oil to make crunchy salad toppings like croutons and breadcrumbs. By lining a pan with a little oil and browning your starchy items until they’re nice and crisp, you’ll add some texture to your salad without resorting to unhealthy bacon or calorie-dense cheese. What about more substantial dinner ingredients? Call her old-fashioned if you must, but Pierce laments the lost art of home cooking. In her view, cottonseed oil can help busy folks rediscover the joy of cooking without devoting their whole evenings to the hobby. Pesto is but one example: Flavored oils, including fresh roasted garlic and shallot, blend perfectly with cooked pine nuts and parsley to create a killer sauce that’s great with lighter proteins. Once you’ve made your pesto, for instance, you can use it to marinate uncooked meats or infuse them with flavor during the cooking process. You can also just drizzle it over cooked shrimp, chicken and pork chops. Since pesto refrigerates well, a batch made on Monday could last you the whole week. That’s something even the most harried home cook can appreciate. Cottonseed oil isn’t just great for turning wild turkey into a moist, fall-off-the-bone treat. According to Wade Fletcher of Hogz & Honeez, there’s virtually no limit to this cooking aid’s versatility—even in the cozy confines of your home kitchen. Fletcher’s a meat-and-potatoes kind of guy, and his wildly successful establishment hews closely to that preference. Accordingly, it’s no surprise that he encourages home cooks to use flavored cottonseed oil—fresh roasted garlic, shallot and chili cumin work particularly well—to season fried potatoes at any meal. Flavored oil also complements sturdy veggies like mustard and collard greens during the sauteing process. Cottonseed oil is great for more traditional home-cooked fare as well. If you’re craving a Friday night fish fry but don’t want to brave the crowds at your favorite restaurant, says Fletcher, you can keep the tradition alive without leaving the house. Simply heat a batch of unflavored oil to the proper temperature—typically between 350 and 375 degrees for cod, walleye and other common species—and ensure that your fish pieces are small enough to fit in your pot. Since unflavored cottonseed oil doesn’t impart a greasy mouthfeel or distinctive foretaste to food cooked in it, you can use the same batch of oil without turning down the heat on your stove to cook the French fries or home fries that you’ll undoubtedly want with your fish. If you prefer a healthier option to go with your fried fish or chicken, Fletcher advises including unflavored cottonseed oil or oil flavored with fresh-roasted garlic in the vinaigrette over your mixed-greens salad. That’s a powerful endorsement from someone who doesn’t even offer salads at his restaurant. Cento might be one of the country’s most innovative Italian eateries, but head chef Michael Pruett isn’t the only American cook who’s doing amazing things with cottonseed oil (CSO). In fact, Pruett advises home cooks to get out of their comfort zone and experiment with this clean, healthy, ever-versatile cooking aid. While Pruett is big on using CSO to sear meats and vegetables, he advises home cooks to break out the CSO before the cooking process even begins. It’s a great base for marinades, he says, because it allows other flavors to shine through. Mix some CSO, soy sauce, diced jalapenos, ginger and garlic to make a spicy Asian marinade for your steak, chicken or pork. While the dizzying range of pre-flavored cottonseed oils offers endless opportunity for marinating, lubricating and enhancing animal and soy protein, home cooks can put their own spin on it as well. “Cottonseed oil is a great base oil for infusing,” says Pruett. One of his favorite uses: poaching pre-roasted garlic over low heat. The garlic transfers its flavor to the oil and makes a fresh-tasting, slightly spicy lubricant for home-tossed pizza dough and marinara sauces. For the more adventurous, judiciously infusing unflavored oil with morel mushrooms or herbs like rosemary can make for incredible flavor combinations that pair well with seared meats and vegetables. Pruett does have one friendly word of advice for folks who want to infuse their own oils at home: “Always taste the oil before you add the herbs and again before you use it.” Thanks to its crisp, neutral flavor, regular cottonseed oil can fall victim to overzealous infusion attempts. When in doubt, dial back your additions: After all, it’s not as if the oil doesn’t have a great flavor to begin with.